After joining the Salon de Provence Air School in 1978, he became a fighter pilot in a combat unit and commanded a Mirage 2000 squadron. After spending 4 years as a test pilot at the Flight Test Center, he returned to the military staff to become head of the Rafale Program for the French Air Force. Once appointed general, he was responsible for the doctrine of the air force, then the armies, before taking command of the air combat forces of the French Air Force. He has served on detachments in Chad and during operations in Bosnia and Herzegovina. After leaving the defense services in 2013, he led various consulting missions in companies, and with Stan Larroque, created the company SL Process, to develop the Lynx augmented reality headset. 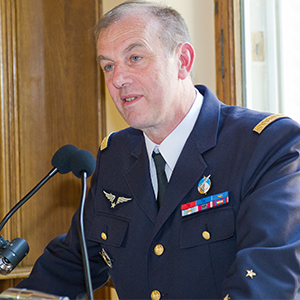 Married and the father of two children, Air Force General (2S) Guillaume Gelée is Commander of the Legion of Honour and an officer of the National Order of Merit.